Number sense is the single best indicator of students’ success in math. It is critical in the Common Core State Standards in math, and is the reason curriculum companies have built their curriculum with all this “new math”. The thing is, it’s not really new, and that’s a topic for a different post. As adults who are successful with mathematics, we have memorized steps and methods that work best for us. We have facts memorized. We use our number sense to do mental math quite frequently. We struggle to see the point with the crazy and convoluted steps students are asked to do because we no longer have to think through problems the way students do. But, have you seen cashiers unable to give you change correctly? Have you heard complaints from people who don’t think the minimum wage should increase because someone didn’t know how to give them change for their $15.27 bill because they gave them $20.02? These adults lack number sense. They are unable to mentally and fluidly manipulate numbers to meet their needs. Many children build number sense naturally through regular exposure and number manipulation in the classroom, however, many do not. If we focus on the outcome and rote shortcuts, and not an understanding of the process and why it works, we are developing students who are not able to problem solve and complete math mentally or independently. In short, number sense is the ability to think fluidly and flexibly about numbers. It’s the ability to reason through a problem or situation and use a plethora of strategies to come to the solution. It moves beyond simple rote learning and memorization and goes into a deeper understanding of how numbers work. How do you teach Number Sense? The good news is that number sense can be developed in many students through intentionally planned lessons, games, routines, and mathematical discourse. Marilyn Burns, a well respected math researcher and educator, has outlined several research-based strategies for developing number sense in students. Take time to explain, and have students explain, which strategy they used to solve a problem and why it was the strategy they chose. Display anchor charts of strategies students know and use. While there’s a segment of people that blame “new math” on not caring if students get the correct answer for the problem, the truth is that the strategy or process a student takes is just as important as coming up with the solution. Computational mistakes don’t diminish the student’s ability to reason through a problem and choose the appropriate tools or strategies to solve it. We focus on problem solving strategies both within our regular curriculum and outside of it. Once a week, we dedicate time to solving a problem and discussing the strategies students used to solve it based on our skill of the week. We also work through a Word Problem of the Day where students work through a story problem unrelated to this week’s skill. Students need to reason through the problem, write an appropriate equation, explain the set up of the problem, and then solve it. Students often come up to the board to explain the strategy they used to help them solve and demonstrate their steps. The students are excited to come up and showcase their learning and it gives an importance to the strategies students choose. Below is a picture from one of our problems in August at the beginning of 2nd grade. One of the things I know I need to improve on is having students explain the strategy they used to problem solve. Today, three came up to show their model and they rocked it. Link to my 2nd Grade Story Problems Bundle is in my profile. We do a Problem of the Day nearly every day. The skills build as the year goes along but spirals in similar formats. The problems scaffold from giving students specific formats to think through the problem, the problem type, and build their equations, to open ended lines and spaces for students to work and solve. The series is from 1st through 3rd grades and can be found in my TpT store here. Mental math challenges students to reason about numbers since they can’t rely on the typical written strategies they’re used to using. This can be done in several different ways. You can give an equation like 156 + 61 and ask students for the solution (if this is an appropriate level of difficulty for your grade level and your students). Students will use their reasoning and understanding of place value to think through the regrouping. Students might mentally take 50 from the 61 to make 206, and then add the final 11. As you first start doing this, it’s important to give students an equation with the right level of difficulty; one where they won’t be able to immediately solve it, but can likely use strategies they already know and are familiar with. These are called Number Talks. You can find information on blogs and various websites, especially through Math Solutions and Marilyn Burns. You can purchase the book on Amazon through the affiliate link below. Number of the Day is the single most important 10 minute block in my classroom. Over the years I had seen postings from Vickie over at Primary Press with amazing math reasoning her kindergartners are able to do and so when I moved down to 1st grade I decided to try it out in my classroom. There are a variety of ways this can be completed and I don’t think I do it exactly the same as Vickie. What has worked for me and my students is to build the numbered day of school (1-180). We started this at the beginning of last year in first grade and it wasn’t anything to be raved about. However, after about a month of school, I was in awe with my students’ number sense and the way they could mentally manipulate numbers. I was able to introduce the concept of multiplication as related to skip counting in the fall of first grade. To my surprise, students started applying the distributive property of multiplication to decompose a number into its place value components (for example (10 x 10) + (10 x 5) + (7 x 1) for 157) with no instruction from me. By the middle of second grade, with the majority of my students returning with me to loop, most of my students grasp multiplication as skip counting or repeated addition and use it with 1, 2, 5, and 10. At the end of last year in first grade, I showcased their progression throughout the year on my Instagram page. Number of the Day is naturally differentiated: high achieving students usually naturally apply skills in new ways or with several steps; low achieving students take less risks and use the commutative and associative properties to give new methods for making the number. The magic comes when students start taking risks and trying new ways. By hearing strategies and seeing them work day in and day out, I’ve seen students begin to use new strategies (and I always praise when a student is trying something new) and as they apply new skills their math achievement typically increases along with it. While this takes quite some time, and isn’t a linear increase, I completely give credit to our Number of the Day. We set a timer with Alexa and work for 10 minutes each day, and we try to build as many equations as we possibly can during that time, so I don’t spend a ton of time talking about strategy here, but choose a couple to highlight the strategy on each day. The kids groan when that time is up because they want to continue to build new equations! I’ll often ask students what strategy they used to help them and encourage them to use another student’s strategy to come up with a new equation. I’ll also often do a quick explanation of how a student got to their solution if I want to make sure it’s explained well or I feel like we’re short on time. You can generally tell if I explained something because there will be circles or arrows around the equations. To better explain my Number of the Day routine, I’ll did a Facebook Live on page to walk through how I manage it each day, and how I pick and choose what to explain and highlight. You can watch it below. I had several tech issues in the beginning so please bear with me. If you are not able to do a Number of the Day routine in your classroom, or if you are teaching a higher grade and want to give students some independent practice, another idea is to have students work through numbers in different formats each day. I have 6 different pages practicing a range of skills, and working with 2-digit to 4-digit numbers. One version is ready to print, label the day’s number, and copy (easy peasy!) The second, is a Google Drive file- perfect for using digitally in Google Classroom. You can get both of these files, and more ideas for building place value and number sense skills in your classroom, by signing up for my newsletter below. You’ll get the printable version right at sign up, and the digital version will be in the first email you see after beginning. It walks you through sharing with Google Classroom in case you aren’t familiar. 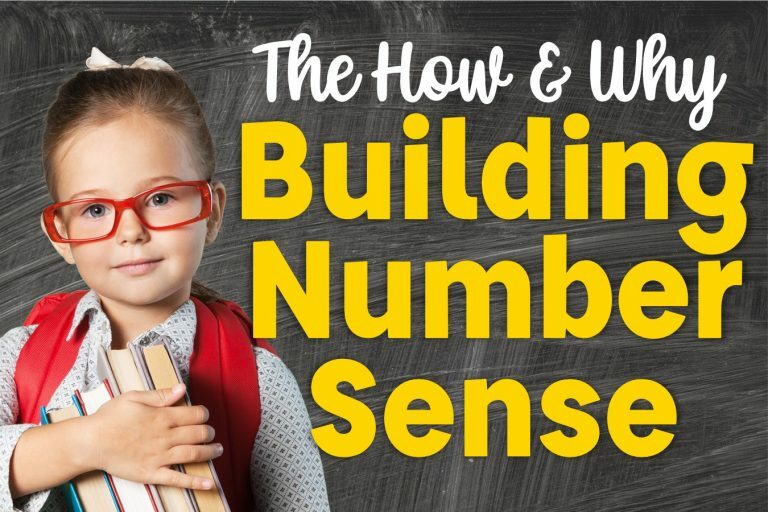 Additional ideas and resources for building number sense and place value skills will also be sent throughout the next few weeks to help you build number sense in your students all year long! I also have a post detailing the importance of teaching Part-Part-Whole Relationships with addition & subtraction. It’s perfect for 1st grade teachers. For more ideas on how to build number sense skills in your classroom, with a look at building place value in the middle grades, click on the image below to head to that post. Read the study referenced in this blog post, and this article from Dr. Keith Devlin referenced above, for further information on number sense and the research behind its importance. Brilliant article I have learnt so much and enjoyed reading all of the links as well. I can’t go live with the facebook as it is too difficult with our timezone – will it be available later? Yes! The post is updated with the video. Please pardon the technically difficulties at the beginning! I’d love any number of the day resources to try in my classroom! Thanks!! Hi there- you can find them in the newsletter link above.